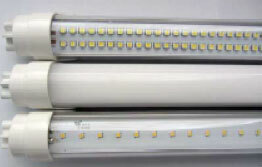 LED Canada has delivered a new level of performance and value with the introduction of its new Samsung T8 LED tube. At 20 watts our newly released T8 LED tube (with remote driver included) replaces a standard 40 watt fluorescent T8, producing 8% more light with 50% less power and an extended life that is warrantied for 3 years. LEDCanada has partnered to offer this SAMSUNG LED solution in a new 4ft T8 configuration with a Color Rendering Index in excess of 80 (colors reproduced perfectly) and over 2000 lumen at 4000 kelvin (with other color temperatures available). By utilizing the Samsung LED chipset this product solution offers a much higher CRI even in cool white, meanwhile, the light emitted by Samsung chip is much more even and consistent than commonly available competitive models. With the quality Samsung is known for to ensure extended life and sustained performance expected to exceed currently comparable products. Designed as a direct retrofit to most T8 lighting fixtures, LED Canada only recommends using Remote driver LED Tubes, not internal driver models for certification and safety reasons. These cUL certified tubes are TRIAC dimmable, shock‐resistant, vibration‐resistant and carry a 45,000+ hours lifetime expectancy. LED lights are UV and IR radiation-free as well as mercury-free making them among the safest lighting solutions for both people and the environment. With this new product LED Canada extends its position as Canada's largest manufacture and national wholesaler of innovative LED solutions.